CodeIgniter is a Model View Controller (MVC) based open source web application framework for use in building dynamic web sites with PHP. It has a very small footprint, built for PHP coders who need a simple and elegant toolkit to create full-featured web applications. Its goal is to enable you to develop projects much faster than you could if you were writing code from scratch, by providing a rich set of libraries for commonly needed tasks, as well as a simple interface and logical structure to access these libraries. For more information see Codeigniter’s official website. 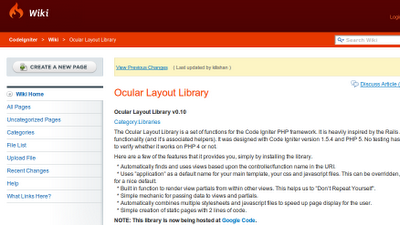 As mentioned above the libraries play a great role when you develop your application in Codeigniter. What really helps you ignite your code, if you are a beginner is the amazing user guide CodeIgniter can boast about. 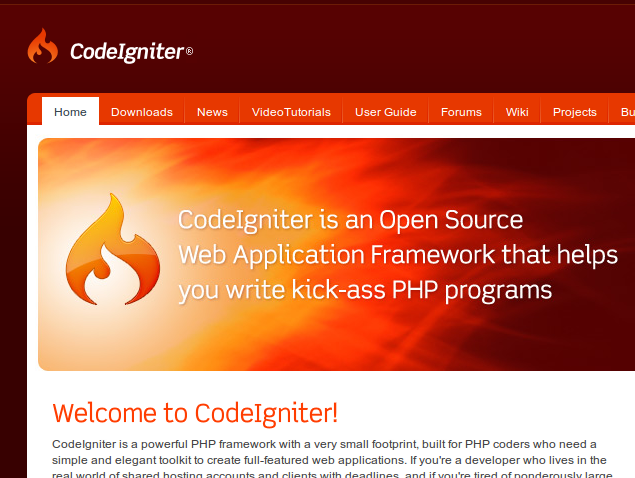 CodeIgniter is most often noted for its speed when compared to other PHP frameworks, see some comparisons here. 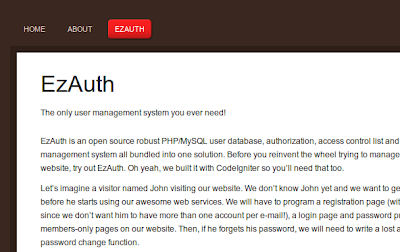 You can view the user guide of EZAuth to know more about it, the current version is 0.6. 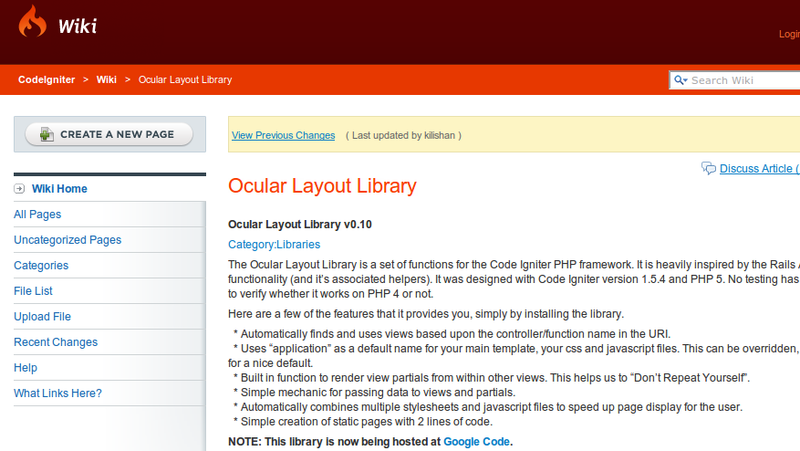 Ocular is by far the best templating library for CodeIgniter, I have used Yet Another Templating System (YATS) but Ocular is amazing. It is a Rails inspired template library following convention over configuration. It is hosted at Google Code and with features like multiple template, partial views, content Yeild its a great library that will meet almost all your templating needs. With CSS and JS aggregation for production in the new version 1.0, its the best for CI for now. CodeIgniter does not come with any native Object Relation Mapper (ORM) library but I could found out IgnitedRecord and DataMapper , after using both to some extent I’d recommend DataMapper. 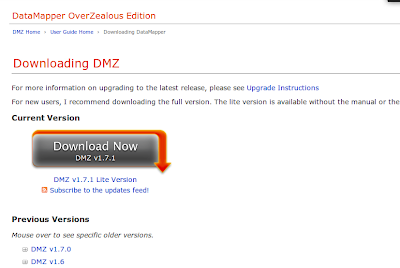 The Over Zealous Edition has some better features than the Datamapper older versions. DataMapper needs the database to be in fifth normal form, and there are some other requirements you can see here. It is designed to map your Database tables into easy to work with objects, fully aware of the relationships between each other. The use of an ORM framework help you a lot, you have an edge over the native Active Record style of coding. Moreover it is more Object oriented with data persistence and as your tables become objects they know the relationships you defined which makes the Create Read Update Delete (CRUD) process easier. CodeIgniter core has a big list of libraries from form to image manipulation to validation but the above external libraries make it easier to focus more on productivity and creativity and less on the code part of it. You can download and use all the above libraries in your CodeIgniter install, from the relative links.Try out some other fresh libraries by Elliot Haughin, here. You can find many libraries for codeIgniter, but above there where the ones I liked when I used it and compared it with similar libraries. Happy Code Igniting and library hunting :).